TROPIKO pool roofing is determined to cover above ground pools or semi and fully inground pools. 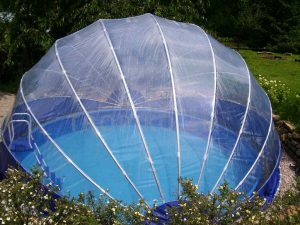 TROPIKO roofing is designed for pools up to a diameter of 5.0 m. Simple but at the same time solid construction makes the roofing of any size easy to handle. TROPIKO roofing is available in diameters of 3.6 m, 4.2 m, 5.0 m a 5.5 m.
Compared with solar water heating collectors, a pool roofing can essentially reach the same effect of increasing the pool water temperature at similar costs. With the pool roofing you will receive additional benefits. The pool roofing will improve climate above the water surface, increase bathing comfort and significantly increase water purity and the pool environment. You will save substantially on pool maintenance. During development, the emphasis was put on the possibility of 100% opening of the roofing for unrestrained swimming under the summer sky. Construction of the roofing consists of formed aluminium tubes with eloxal coating. The selected design ensures high strength and easy handling. A special clear polished foil, which is resistant to UV radiation, is stretched over the construction. Due to the high transparency no feeling of enclosure arises even if the roofing is shut on. Protective stripes of blue polyester with water repellent finish are stitched to the lower edges of the cladding. One-sided opening is solved by a unique hinged segment designed by our own design office. Installation of the roofing does not require any construction work or landscaping.